Stop! And Smell the Poses – Originally featured in the Times Colonist Newspaper – Labour Support and Doula Services, Victoria B.C. Labour Support and Doula Services, Victoria B.C. They look statuesque. Some look difficult. Some look impossible. Some look absurd. None of them look particularly spiritual. In that moment you’ve already lost the point, and I bet you’ve lost your balance and fallen out of the posture. What if that person you’re comparing yourself to isn’t thinking about their core, what if they’re just at one with the posture, and its meaning?…it’s deeper meaning. Let’s use the pose warrior two as an example. It’s one many would recognize so seems fitting to use it as the archetypal yoga posture. Often on yoga posters at studios-the picture of the warrior features the thriving, determined face of the yogi delegate. It’s the pose that symbolises being alive and vibrant. The form it takes can be beautiful, but its function is the real essence. Warrior two or Virabhadrasana (veer-ah-bah-DRAHS-anna) ) the name of a fierce warrior who was an incarnation of Shiva (One of three Hindu gods believed to be the deity of dance, and destroyer of the universe…in a good way). Shiva is described as having a thousand heads, a thousand eyes, and a thousand feet, wielding a thousand clubs, and wearing a tiger’s skin. Maybe you feel you are the embodiment of all that when you’re in warrior 2, or maybe you just feel a thousand muscles burning. Bam, there it is. Evolving means being our best self. Performing a pose means squat (no yoga pun intended) if we don’t know what its higher function is. So, we know warrior two works our legs and bum, opens our chest, lengthens and strengthens the spine. But we’re also creating a duality of base (foundation and solidity) paired with lightness (expansion). It’s great to feel strong and solid in a yoga pose. But, if we can find a lightness in some part of our postures we can feel an expansion in our physical body that radiates out to others. This in turn, fights the fighter in all of us- the one who needs to always be right, the one who can’t let their guard down for even one moment, the one who fights to move out of places of discomfort before they’ve even hung up curtains. It’s good to be a warrior in life. We often need to be a foundation for others, and ourselves. We also need to be able to fight in times of hardship for others and ourselves. The Warrior is said to help us combat our own ignorance and ego in doing the former, not others. No one’s saying that is easy, but it is a facet of the spiritual practice of yoga; doing it does bring us closer to our own divine spirit. Warrior pose offers you the chance to ponder how you can be more grounded while maintaining a sense of open lightness. This coupled with breath and the other observations, or the limbs of yoga offers us the ability to be free beings, unclouded and awake in our postures and in our life. Food for thought for your next practice. You wouldn’t just wolf down a gourmet prepared meal without first savouring it or asking how it was prepared and what makes it special, why treat your poses any differently…..or do you? 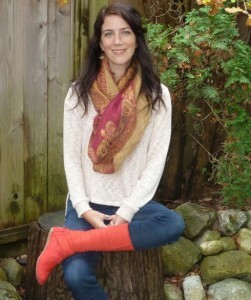 Sarah-Jane Steele is a Journalist, Mother, trained Doula and Yoga Teacher. She hails from Halifax and now lives in Victoria with her family. You can contact her regarding any of the above at, sarahjane@birthspace.ca.